The object of dressage is the development of a happy athlete through harmonious education resulting in a horse that is calm, loose, supple, and flexible but also confident, attentive, and keen thus achieving perfect understanding with his rider. That statement is in the Dressage rule book of the International Equestrian Federation and it is in our United States Equestrian federation. This is also my goal. I am open to information from any source that can help me obtain this objective. It is my feeling that this objective is where we must START... Then we can see how far we can go with the horse's blessing and permission. What is a Happy Athlete? A happy athlete is keen to put in effort. They love to move, feel invigorated by their exercise, and want to come back for more. We would consider ourselves lucky to find such a horse ... But happy equine athletes can be created! The key is to know what makes your horse feel good and then create a training program that is fair, fun and provocative, yet predictable for him. The training program needs to be inherently adaptable to each individual's needs, yet have enough structure that you don't miss anything. You will need to become a master of balancing Precision & Play. There is no Formula without 'U'! The reality is there never can be one recipe to follow. There will always come a horse that needs something different. That is why Dressage Naturally has lots of flexibility built in, and why I highlight teaching riders the logic of problem-solving. The best kept secrets really are between you and your horse, so success depends on YOU! What I can do is give you the ingredients that you need, the permission to experiment, and the confidence to trust that you will know a happy athlete when you feel one! Is your heart in your riding? Dressage Naturally is for you if you want to really enjoy every part of the process of progressing with your horse. It is for you if you are willing to put your horse's experience ahead of your ego and are are more interested in the quality of the journey than forcing results. It is for you if you realize that peak performance is about creating a relaxed, energized, balanced, confident, and proud horse that willingly offers his best. I do believe that dressage can be fun, and that horses can enjoy it as much as we do. Together we can do what neither of us can do on our own ... The day I stop believing that is the day I stop doing dressage. My goal in Dressage Naturally is to educate you to be a better advocate for you and your horse, to actively practice LOVING what you do, and to be more responsible for your own development. Dressage Naturally is a bridge between the natural horsemanship and dressage worlds. 'Dressage' and 'Natural Horsemanship' bring up different images for different people. Dressage primarily focuses on gymnastics, and the physical development of the horse. Natural Horsemanship primarily focuses on the partnership and the mental/emotional development of the horse. As horsemen, we need to take the whole horse into account. 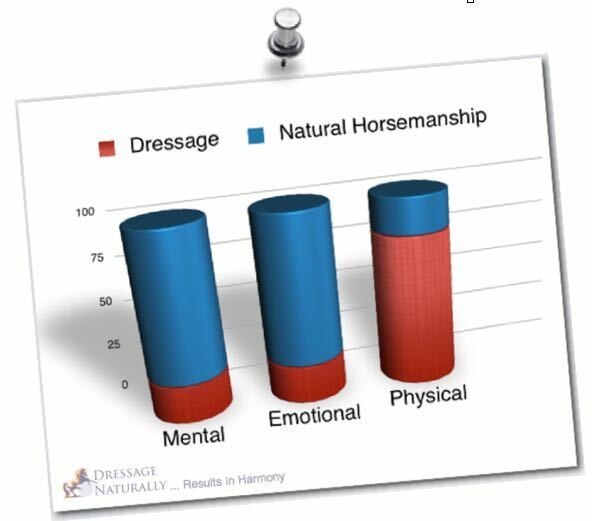 With the combined information of Dressage and Natural Horsemanship, we have a greater understanding of the mental, emotional, and physical aspects of the horse. Article 401, The Object Of Dressage: The object of dressage is the development of the horse into a happy athlete through harmonious education resulting in a horse that is calm, loose, supple and flexible, but also confident, attentive and keen, thus achieving perfect understanding with his rider. Who could argue with that? If people from dressage and natural horsemanship circles will stop criticizing each other, they just might notice that they both want the same thing. Understand our horses' world so we can keep them safe and happy in our world. Have a fierce sense of responsibility to each individual horse. Allow them the most natural living experience that we can (freedom to move 24/7, barefoot is the ideal goal, opportunities for socializing with other horses, exposure to variety, forage-based diet). Partnership means we act like partners, not predators. We need to get our own act together so we can arrive to our horse as calm, centered, authentic, light-hearted, and focused beings. Horses really do want to understand what the heck we are talking to them about! We need to value the quality of the communication as the priority. We owe it to our horses to help them recover from the burden of carrying our weight. Healthy biomechanics is not about putting a horse in a shape or position that we think looks good. It is a process of working with the horse's movement dynamic to help him find the place where he feels balanced and can move with greater freedom, power and ease. This is the progressive development of the horse's suppleness, straightness, and engagement. The basics of gymnastic training can be used to benefit any horse. The goal of the movements should be to achieve balance. Advanced gymnastics then challenge and test that balance. Forcing a horse to advance gymnastically at the expense of the object of dressage is hurtful. It is our responsibility as the rider to hold ourselves to a greater standard than we hold our horses. Great leaders and communicators always look to themselves first when there is confusion or lack of clear direction. Precision arrives out of the possibilities that play creates. A playful attitude will create an openness to learning and allows for the inevitable lack of perfection that comes with the process. Students and horses can benefit from feeling free to experiment rather than paralyzed by the fear of being 'wrong'. However, the ability to be precise in riding specific movements will yield the best gymnastic results. If you are happy, then it will be easier to find harmony with your horse. From a place of harmony you will better be able to communicate with him. 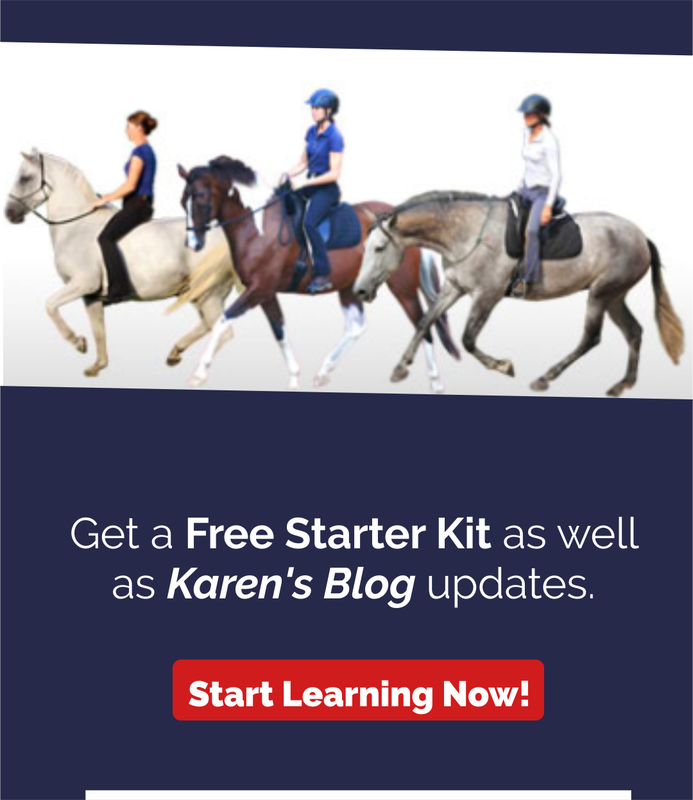 Some of the things you can communicate about are techniques that can lead to dressage. Spend more time being happy than doing actual dressage. The alternative is to do a lot of dressage, and rarely be happy ... And that doesn't sound like any fun at all. The biggest breakthroughs with students come from helping them trust their own instincts. Balance, Harmony, Rhythm, Elasticity, etc. feel good. Harmonious and clear communication is unmistakable. If students get stuck in their heads wondering if they are 'right' or 'wrong' they stop feeling what the horse is really telling them, and they stop being able to respond to the horse in the moment. Having a clear picture and trusting your instincts will give you the ability to respond well and make better decisions. Let's love what we do, have fun doing it, and help our horse feel the same!